Who's that girl with the chic nails? Well, hello there I'm Rose. Haha. I have another tutorial to share with you guys today that I think you will really enjoy. 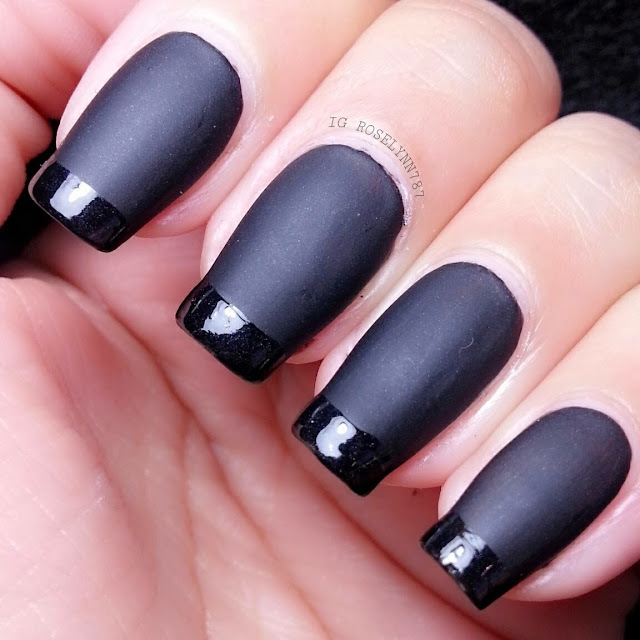 I just posted a photo on my Instagram of my recreation, matte black french tip nails. It's a very popular look that has been recreated many times and shared all over the web. My boss was actually the one who brought it to my attention and said I should recreate it cause it looks "badass" haha. He was very pleased when I showed him this morning how they came out. These are just what I used, but any variation in product brand will work just as well. The only thing I would be picky about is the matte topcoat because you want one that will really matte down the shine. From the various matte polishes I have experienced, I do feel like Matte Finish by Butter London works extremely well. Now let's move on and get our nails done! First step is, of course, use a base coat to protect your natural nails. Next step is to apply the black polish over your nails. 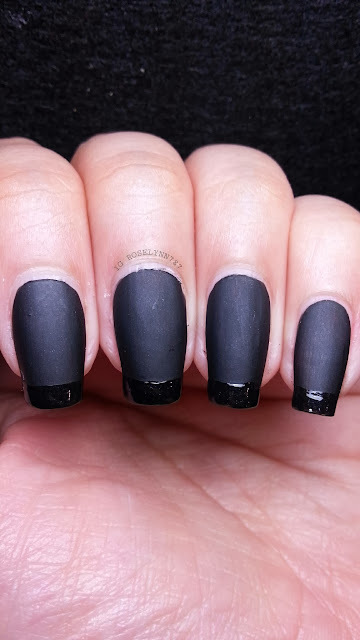 You should only need 1-2 coats if you are using Raven by Zoya. You definitely don't want a streaker here so be careful of the polish you choose. After your nails have fully dried, start applying your matte polish over the entire nail. You guys have to make sure your nails are completely dry prior to adding the matte coat. I cannot stress this enough. If you're nails are not completely dry, the matte will create 'bald' spots in certain areas or smudge the polish altogether. If you use Matte Finish by Butter London, you should only need to use 1 coat. I suggest using a matte polish that only needs 1 or 2 coats. Now for the final step! Remember to let your nails completely dry before proceeding to this last step. Take the shine topcoat of your choice and create a thick line straight across on the tip of your nail. Remember you're going for the french tip look, so you don't want it too thick. I found it easier to rotate my finger from right to left against the brush, instead of going across with the brush itself. You want the line as even and straight as possible so move slowly. You may need to add two coats of shine to the tip of your nail, depending on the topcoat you use. And that's it. Finish off the rest of your nails in the same manner and you'll have yourself a super cute manicure to show off. Wasn't this an easy look to accomplish? Like I said, I couldn't get the tape to work properly for me and I ended up having to start over twice. I hope I've been able to help those who might have had the same issues as I was having. I'd love to see this look with other colors! Please share your recreations with me on instagram @ roselynn787. Hi there! I am your newest follower, thanks for stopping by my blog Meetmeonthebrightside.com! I LOVE your blog! I love the clean design, great pictures and your writing style is fun to read. I'd love for you to stop by my blog over the weekend and add your blog url to my Blog Hop link list, I think my readers will love your blog! I look forward to reading more! Thank you so much for following me! It means so much to me and I'm glad you enjoy my posts. I will definitely stop by and join the Blog Hop, have been having my eye on it for days waiting for the sign up to start. New follower here, I really like this manicure! I may try it in another color. I'd love to see what you come up with :) and have returned the love and followed you back. Now this is to die for! Super hot! I never imagined doing this with black! Nicely done! 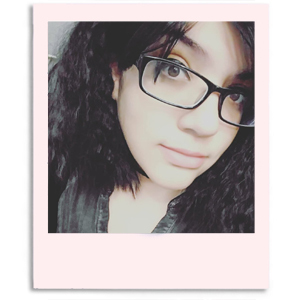 Followed your blog, hopefully you can follow back!